A 3-piece kit for kids specially designed to eliminate tears and tangles, featuring Shampoo & Body Wash, Conditioning Hair Detangler, and Detangling Brush. Tear-free hair and body wash gently cleanses hair and skin without over-drying. Nourishing fine mist instantly detangles and smoothes for shiny, healthy hair. Tears and tangles no more! Lightweight detangling brush easily removes knots from wet or dry hair leaving it smooth and silky. 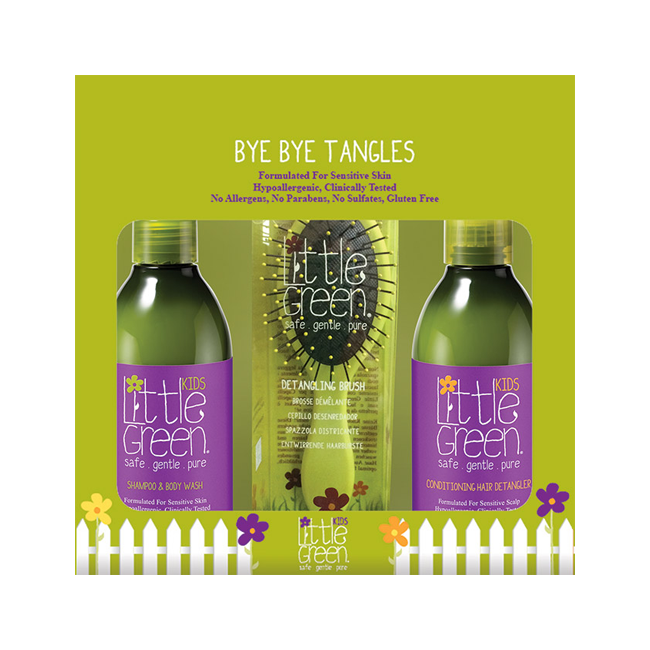 Use with Little Green Kids Conditioning Hair Detangler for shiny, healthy hair. Petite size is perfect. Shampoo & Body Wash: Pump a small amount into palm, lather and rinse. Conditioning Hair Detangler: Spray over wet hair and comb through, no need to rinse! No reviews yet. Be the first person to write a review about this product Write a Review.